•America's #1 Brand in Quality Cutlery for Over 50 Years •440A High-Carbon Stainless Steel with Full Tang, Triple Rivet, and Thermo-Resin Ergonomic Handles •American Made Products, Manufactured Entirely in the USA by American Craftsmen •Ergonomic handles - Universal fit for large or small, left or right hands. Thumb and forefinger lock into place for safety and control. Fatigue-resistant design. •Full Tang - Blades extends full length of the handle for extra strength and balance. 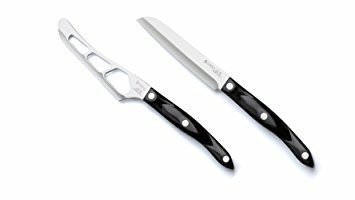 •Exclusive Double-D Edge - The Double-D® edge provides a clean, smooth cut every time and stays sharp longer than straight-edge knives. Can be factory sharpened. •Santoku Style Trimmer has a 4 7/8" Double-D®-edge blade •Perforation holes on Cheese knife blade's surface helps cheese fall away during cutting. Ergonomic handles - Universal fit for large or small, left or right hands. Thumb and forefinger lock into place for safety and control. Fatigue-resistant design. Full Tang - Blades extends full length of the handle for extra strength and balance.